Helen Robertson was the eldest of seven children born into a working class family in the mining town of Hamilton in Scotland. 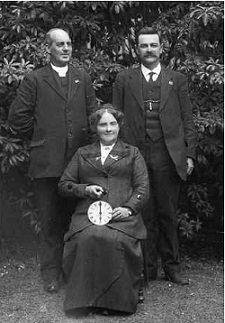 After starting her working life at 12 as a silk weaver, she moved to Glasgow as a teenager to become a domestic servant, joined the church there and met and married John Barton, a young engineer. John and Helen had six children. John Barton was successful in his career and designed an anchor which he patented and which was bought internationally. With the proceeds of this innovative anchor, John was able to retire early. Sadly, in 1895, John Barton contracted smallpox and after 10 days in hospital he succumbed to the disease and died. John Barton was just 42 years old and Helen was 38. Left with 6 children (and 3 others that she'd taken in) to support and only a small income, Helen Barton became a restaurateur. With her strong religious convictions, however, this was not enough for Mrs Barton and, having witnessed directly the poverty in the East End of Glasgow, she made the move into public life. taught Sunday School (a vital source of education for the working classes) and clearly recognised the importance of education for the advancement of the poor. The photo on the right shows the Shettleston School Infant Girls Class 1896 - it is just possible that the class includes one of Mrs Barton's daughters. In 1901, Helen Barton was elected as Parish Councillor in Glasgow. The Parish council dealt with social issues (roughly the equivalent of today's Social Services), while the Town Council dealt with infrastructure such as roads and transport. The first female Parish councillor was Eliza Jane Aikman, and Mrs Barton joined her on the Council and served on some of the same committees. Helen Barton served on the Lunacy Board, Children's, Medical, Poorhouse & Old Age Pensions Committees, as well as the Infant Mortality Board and the Borough Distress Committee. When Mrs Barton joined the Parish Council, life expectancy was 50, infant mortality was 140 per thousand across the UK, but much worse in crowded urban areas. Mrs Barton quotes a rate of 226 per thousand in parts of the East End of Glasgow. There was no welfare state, no national health service and unemployment and overcrowding were rife. The Parish Council had a huge responsibility to change things for the better. This was presumably an early attempt at Health Visiting, and its impact was enormous. Infant Mortality in the UK now stands at under 5 per thousand. The Borough Distress Committee set up an employment scheme designed to offer temporary work to unemployed men. Bog land was bought near Cumbernauld and men were given jobs draining the land and digging peat to make it suitable for farming, then working on the farmland to grow crops. Transport for the men was provided plus two meals a day and wages were given directly to the wives to ensure that the families were provided for. 12 weeks paid work was offered per man. 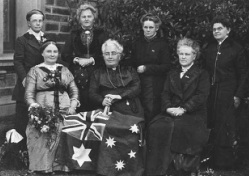 Women's Christian Temperance Union (W.C.T.U.) - travelling the world campaigning, including 3 trips to Australia and New Zealand totalling 8 years. Was made a life member in 1926. She was described as "the Queen of Scottish Orators"
Towards the end of her third visit to Australia, in 1926 and aged 70, Mrs Barton was asked what she intended to do next. She is quoted in one newspaper article as saying she would write a book about her Australian visits. "Laughs and Sighs from Sunny Skies" was published in 1927. She also published two songs in 1927 - "My Ain Hameland" and "A Sprig of White Heather"
Scottish Women's Liberal Federation - serving on a number of committees, including suffrage - she was able to cast her vote for the first time in Australia in 1917 at the age of 60. Scottish Home Rule Association - Mrs Barton was a supporter of home rule in both Ireland and Scotland. Presbyterian Church of Scotland - first woman to be elected an elder of the Presbyterian Church of Scotland (1930). Founded the Domestic Servants Friendly Society - to provide welfare and pensions for female domestic servants. Rutherglen Insurance Company - one of the committees set up in the early days of National Insurance deciding who should get benefits. The Peace Society - Helen Barton attended the opening of the Peace Palace in the Hague in 1913. Helen Barton continued as a popular public speaker into her eighties. In failing health, she would be accompanied by her Granddaughter Jean who, as a trained elocutionist, would also be part of the entertainment giving recitations. Jean (herself an accomplished woman and still active in her nineties) reports that, even in her old age, Helen Barton could hold an audience in the palm of her hand. Helen Barton is pictured in the middle (with the flowers) on her 80th birthday surrounded by her family. Jean is standing directly behind her. History Woman Comment: Helen Barton was my great great grandmother and was the starting point for this website. If you have any information about Helen Barton, her work, or her family, please do contact me. Please also contact me if you want to use any of the information or images on this page. Thanks. With thanks to Jean Hood, Lovey Culley, Eleanor Kelly, David Watson Hood, Richard Winton, Maggie Winton, and Melbourne University for contributions of photographs, documents and stories. Thanks to the Mitchell Library for their Parish Council records and other archives and thanks to the internet generally for enabling me to find copies of Helen Barton's book and sheet music. Special thanks to Trove, the National Library of Australia's fantastic free online archive - simply the best in the world.